Dana Cochran, Jefferson Lab staff member, helps students as they participate in a coding activity. To raise awareness of the need for digital literacy and a basic understanding of computer science, Jefferson Lab’s Information Technology Division and Science Education staff are encouraging teachers, students and their parents to participate in the “Hour of Code” campaign during Computer Science Education Week, Dec. 7-13, and throughout the year. Nearly every aspect of life is now impacted by computers and the use of computerized devices. 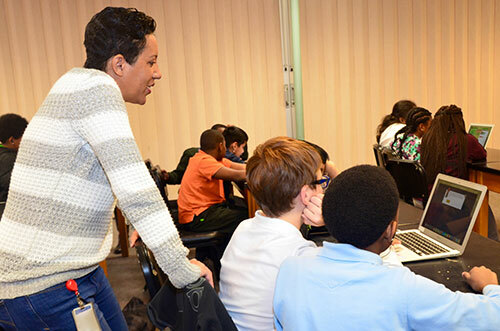 The proponents of Hour of Code believe that it is important for students to have at least a basic understanding of how computers work and that every student should have the opportunity to learn computer science. The goals are to help nurture problem-solving skills, logic and creativity and open up 21st-century opportunities and career paths. Members of Jefferson Lab’s IT Division and Science Education staff are conducting Hour of Coding activities with BEAMS students throughout Computer Science Education Week. BEAMS, or Becoming Enthusiastic About Math and Science, is the lab’s long-running, hands-on, activities-driven program for fifth and sixth graders. Lab volunteers interact with the students during the activities and share some of their excitement and passion for their careers. In addition to BEAMS, Science Education staff conducted training sessions with each of the 60 teachers enrolled in the 2015-16 Jefferson Lab Science Activities for Teachers, or JSAT, program. Forty of the teachers have signed up their classes to participate in the Hour of Code initiative. The webpage includes lesson plans for teachers participating in the initiative. The Hour of Code tutorials are aimed at all ages worldwide, according Boehnlein. The students can write code for any or all of the Hour of Code animation activities: Star Wars, Minecraft, and Frozen with Anna and Elsa. “Learning the basics of programming was great for my understanding of physics,” she added. She looks forward to being a resource for today’s students as they become tomorrow’s programmers and computer scientists. Jefferson Lab is supported by the Office of Science of the U.S. Department of Energy. The Office of Science is the single largest supporter of basic research in the physical sciences in the United States, and is working to address some of the most pressing challenges of our time. For more information, visit science.energy.gov.